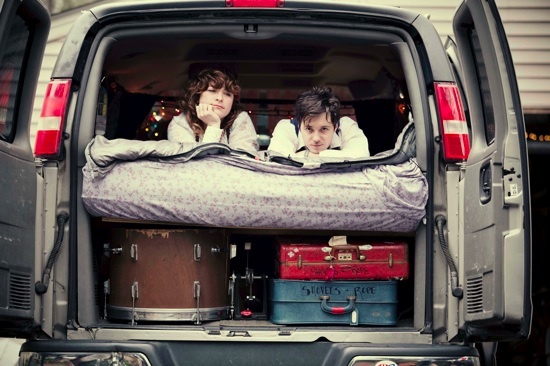 Playin’ In A Family Band: An Interview With Shovels & Rope | True Endeavors Presents: music, tours, tickets, mp3 downloads, concert pictures, videos, Madison WI. Before the raucous murder ballads of Shovels and Rope, its members Michael Trent and Cary Ann Hearst were individually known as expert songwriters in the Charleston music scene. But when the two artists met for the first time, a friendship was born out of mutual respect, leading to a series of intimate collaborations that blossomed into romance and eventually marriage. Now touring the country as a family, the duo’s bond is all but apparent on a stage of shifting lights. Trading instruments in between songs with an unconscious ease as if sharing mind and body, the pairing is truly a force. Before playing at the High Noon Saloon tomorrow night (tickets here), I talked to Hearst and Trent via conference call about their debut album O’ Be Joyful, opening for Jack White, and the importance of coffee and dogs. True Endeavors: Do you remember the first time you met each other? Cary Ann Hearst: The first time I saw Michael, he walked into a bar in Charleston, S.C. and I said, “I don’t recognize him!” because it’s a small town. Trent: Somebody had hipped me to Cary’s band at the time called The Borrowed Angels, so I already knew that she was this amazing singer. My friends and I came to check her out at this bar, and I remember her being shorter than I thought she was going to be. Hearst: I was in love with [Michael’s] band at first sight. [Laughs.] But nah, it wasn’t love at first sight. It was friends at first sight. You were both accomplished musicians before teaming up. When you create music, do you ever make a distinction between what a Shovels and Rope song sounds like compared to your independent work? Trent: What do you think, Cary? Is that one for me? Hearst: I’d say that’s one for you only because the dog is whining at me and I need to get him out of the RV before he drives me crazy. So yeah, take that one. Trent: [Cary and I] had both had individual careers for quite a while before we got together for Shovels and Rope. We’re both very different songwriters and singers, so I guess when we first got together, I’d always played in rock bands and Cary had come from the traditional country music, real rootsy Nashville, Mississippi stuff. So I think I was always kind of trying to learn how to write country songs, and [Cary] was getting into rock and roll. Just about the time we met, our interests were peaking in those things, so I think we’ve each brought a little bit of something that the other wanted at the time. I’ve talked to other groups who describe the band dynamic as being as close as a family when touring, but there is usually the inevitable separation. What’s it like touring with your spouse? Trent: I feel like it’s pretty second nature at this point. It’s like we’re running a business together. We keep the two pretty separate; when we go home, it’s not all about music or anything. We try to do the things we did before we even got together, to stay creative and stay inspired. But we have a very normal home relationship. I’m surprised actually, because at the beginning of it, we were a little bit unsure about [forming a band], because we were going to be spending a lot of time together. We asked ourselves: Is it going to be too much? And it’s not. It’s really pretty easy for us. Hearst: It may be different for people who aren’t married to each other because it’s more complicated. People who are just friends are in a different relationship to spend the kind of time [Michael and I] spend together. But we want to spend all the time together. It’s kind of like old times, too, like ma and pa out on the open range, forging in the forest to build their cabin in the woods. In that sense, it’s just like any other mom and pop business, like a grocery store or laundromat. [Laughs.] Or a rock band. Two images that stuck with me while I was looking at your photos and videos are the image of a bed crammed into the back of a van and a recurring dog. Could you tell me about them? Hearst: I’ll talk about the van Michael, you talk about the dog. The dog is our best friend. The van came into our lives as the result of Michael’s band The Film, who had the van after they’d gotten a record deal at the time. One thing that had been missing in my life at the time was a dependable vehicle that could take me or whoever on the road. So the van is basically what we’ve toured and lived in for two years. We have it fixed up–there’s a bed in the back with all of our stuff stuck underneath. So it was discrete and orderly. It wasn’t like most band vans. It was not dirty and never smelled bad. It was very homey, and it had a kind of living room in the middle with a rug that tied it all together. It’s an inanimate object, clearly, but we still feel very familiar about it as it’s carried us across the country two or three times safe and sound. And then once it got about 200,000 miles, we decided that rather than run it into the ground, we’d upgrade our situation. So we invested all our money into a Winnebago View, which is what we travel in now. It’s literally a house on wheels, so it’s even more Leave It To Beaver than it was before. Trent: And the dog is our buddy. His name is Townes and he’s about four now. We had him before we started doing any of this, and he goes on the road with us all the time. He makes appearances in videos whether we were really planning on it or not. He’s always photo bombing at photo shoots. He’s funny. He’s a little bit of normal life that we bring along with us [on tour] to keep us grounded. What are the songs on O’ Be Joyful that mean the most to you, either listening to or performing live? Hearst: I’m partial to the last song on the record [“This Means War”]. I remember Michael woke up one day and told me he had a scary dream about somebody dying. He was writing “This Means War” at the time, and the song ended up being about a man who woke up from this scary dream to feel really appreciative of the things in his life and seize every minute of it. And then at the end of the recording, [Michael] added on an old tape of me and my papa on my mother’s side talking about grandpa stuff. He was talking to me about a dog, and how dogs should take care of you, look after you and not let anyone bother you. (Which is kind of what we have with Townes.) It was such a sweet thing, and I hadn’t heard my grandfather’s voice in a long time. So that [song] is particularly tender to me. Recently you played three opening shows for Jack White. How was that experience? He’s at an interesting point in his career right now. Trent: It was amazing. It was something really special to see and special for us, because we are fans, and we sort of got this last minute phone call to come up to do shows in Charlotte, Boston, and Columbus, OH. We were kind of blown away by the production of the show and by the professionalism of [White’s] crew. Also, they were really nice to us, which is not always the case when you are a little band opening for such a big band. But I was impressed with how much detail was put into everything. It was kind of like one of those “check that off the list” moments in our lives. One of my favorite songs on the album is “Kemba’s Got The Cabbage Moth Blues.” What gives each of you the cabbage moth blues? Hearst: [Laughs.] Well, do you know what a cabbage moth is? No, let’s start with that. Hearst: A cabbage moth is a moth that eats all your leafy green winter vegetables. It’s a plague that destroys crops, basically. And my girl Kemba, she’s a farmer friend of mine who was talking about how she’d found that the organic remedy for cabbage moths is to take jalapenos and soak them in vinegar and water and then pour that over the plant. Then the cabbage moth wouldn’t have anything to do with [the vegetables.] So she was having the cabbage moth blues because she’d lost the crops. Trent: Similarly, a lot of mine and Cary’s life is hotel based. On the rare occasion we check into a fancy hotel that someone has hooked us up with for free, and then they still charge you for internet and it’s as much as a low-class hotel we would have stayed in anyway…[sound of dog barking in the background] That’s our dog. Hearst: Townes gives me the cabbage moth blues when he barks for no reason!